As the weather begins to cool, many species begin to prepare for fall and winter. What happens to butterflies, and how can we help them with our gardens? Monarchs are well-known for their migratory habits, but other species like common buckeyes, painted ladies, red admirals and variegated fritillaries also migrate. All of these species need late-season flowers to fuel their journey. In addition, the majority of our butterflies (and moths) in Maryland hibernate in one life stage or another. Many species that overwinter as caterpillars will hatch and burrow into the soil by their respective host plants. For example, great spangled fritillary caterpillars can be found around violets while Baltimore checkerspots will to make their way into leaf litter by white turtlehead. Similarly, other species will hibernate in their chrysalises or cocoons in a protected location. 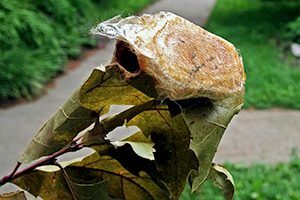 Luna moths hibernate under leaf litter as a tightly wrapped leaf cocoon, while cecropia moths often overwinter as a cocoon on the branch of a shrub or tree. Some species will overwinter as adults. Generally, these species spend the colder months safely tucked into crevices, under or in between logs or underneath loose bark on trees. 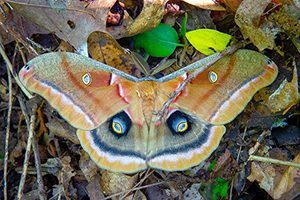 These species, particularly the mourning cloak, often can be seen flying on the early days of spring, and occasionally even during warm spells in January or February. Fuel fall pollinators with late-blooming nectar plants like goldenrod. These plants are especially helpful to migratory butterflies as well as those that reproduce late in the season. Leave the leaves! Leaf litter helps replenish soil nutrients and provides overwintering habitat for a number of beneficial invertebrates. If you can’t leave leaves throughout the yard, consider creating a leaf pile or adding leaves to compost. Because leaf litter also can serve as tick habitat, it is best to remove thick leaf litter between late March and mid-June in areas where people and pets frequent. Tick predators like wolf spiders also need the leaf cover. Consider creating a wood pile for overwintering butterflies. Leave the wood in contact with the ground to encourage decay. Place wood near late-season nectar plants and/or host plants. The larger diameter wood pieces often are the most valuable, but smaller diameter twigs can also be used. Fast rot woods includes elm, pine and sweetgum, while slow rot woods includes hickory, maple and oak. Each type of wood provides different benefits. Because wood piles also attract snakes and other wildlife, they should be placed away from house foundations. Ditch the fall garden cleanup. Besides leaving leaves, consider leaving standing flower and grass stalks in your garden. Sometimes, these stalks harbor chrysalises or pupal cases from local insects like native bees. These areas also provide winter shelter and food for birds. Remove plants in the spring. Generally, by the time the grass needs its first cut in the spring, the pollinators have emerged. One exception: if plants are diseased, then it’s usually best to prune and discard cuttings to prevent harboring pests that may hinder next year’s growth. Sow seeds and plan out next year’s garden. 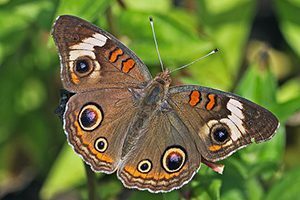 Our butterfly checklist details all of Maryland’s butterflies and the plants they use. Check out our pollinator page for additional ideas.